[PDF] 5 Steps to a 5 500 AP Calculus AB/BC Questions to Know by Test Day, Second Edition | Free eBooks Download - EBOOKEE! Description: From Limits and Continuity to Integration, Areas and Volumes, there is a lot of subject matter to know if you want to succeed on your AP Calculus AB/BC exams. Thats why weve selected these 500 AP-style questions and answers that cover all topics found on these exams. The targeted questions will prepare you for what youll see on test day, help you study more effectively, and use your review time wisely to achieve your best score. Each question includes a concise, easy-to-follow explanation in the answer key. You can use these questions to supplement your overall AP Calculus AB/BC preparation or run them all shortly before the test. Either way, 5 Steps to a 5 500 AP Calculus AB/BC Questions will get you closer to achieving the score you want on Calculus AB/BC exams. 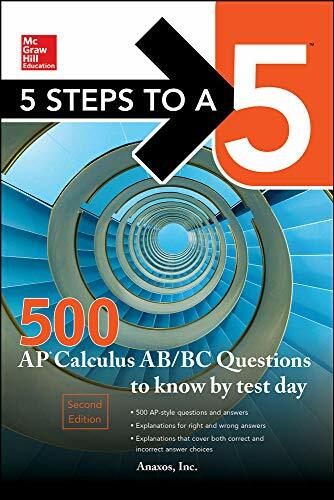 No comments for "[PDF] 5 Steps to a 5 500 AP Calculus AB/BC Questions to Know by Test Day, Second Edition".